Microsoft has uploaded two short video compilations of the Students to Business day and the Techdays to Chopsticks. A little note about the second Techday, last Thursday. I started this day with “The Daily Scrum”. I had no idea what scrum was but I had heard at TechEd that this had been an interesting session over there so I gave it a try. Those two guys, Stephen Forte and Joel Seminuik, where pretty funny. They tried something difficult: having an interactive session with a Belgian audience. Also notable: Stephen made a lot of his slides “on the fly”. Often funny, but distracting when Joel was talking at the same time. Anyway, I have learned what scrum and “the daily scrum” are, something I probably wouldn’t have learnt at school. Then, it was time for my daily IT pro session. Tom Decaluwé talked about UAC in this session. At first I liked it, but after a while it started boring me. Probably because I do care about UAC, but not about how to use Group Policies to configure it. I ended this last Techday of 2009 with a session of Ingo Rammer about Windows Azure. Without doubt the best sessions I’ve seen that day. I already knew a lot about Azure, because I’m working on a big project in it, but still I learned some things and Ingo certainly masters the art of presenting. Looking forward to see all of you again, next year at the Techdays and at the Students to Business day! Today, I have attended the first day of the Techdays at Metropolis Antwerp. The Techdays aren’t as straight-forward as the Students to Business day we had yesterday. This conference is organized by Microsoft for both IT professionals and developers. In every session slot you can choose between three IT pro sessions and three developer sessions. In this blog post I will only talk about the sessions I have attended during this first day. In general, the Techdays are bigger than the Students to Business day. It’s a two-day conference with twice as much participants, a bigger exhibition, more sessions (and simultaneous sessions), … The Techdays are of course more expensive than the Students to Business day (400€ opposed to the free day for students). I was there for free, as a Microsoft Student Partner, but I strongly believe this conference is worthwhile for other students as well, they can get a 75% discount (so that’s 100€ instead of 400€). There were two keynotes (at the same time): one for IT pros and one for developers. Although the keynote for developers was the same as yesterday, I chose to go and see that one. It was a lot better than yesterday. I suppose I wasn’t the only one who noticed the technical difficulties, as most of those were solved today. All microphones were working, the cameras were placed better and the orange and red lighting was a lot better than the bright blue lights yesterday. The content was more or less the same, except that today Hans Verbeeck spent some more time talking about Surface and showing applications on the Surface. Gregory Renard’s demo application for the Surface again had some difficulties to get started, but Hans dealt with that while Gregory was explaining his code. It still wasn’t a super good Surface demo, but it was better and they couldn’t have changed a lot more than that in a day. Peter Himschoot must have made some offerings to the demo gods last night, because luckily his demo worked fine today. Katrien De Graeve had obviously practiced a bit on the HP Touchsmart and the video and lighting were better as well. A little personal note about the keynote: at the Students to Business day we had a very critical audience, there is a lot of criticism about Microsoft in academic environments. Too much went wrong during that keynote and today the speakers have proven that it could have been better. That’s kind of a pity. After the keynote I went to “The future of C#” by Bart De Smet, a Belgian who is now working for Microsoft in Redmond. His sessions are often very difficult. This one, however, wasn’t that hard to understand and it was one of the best sessions I’ve seen today! After the lunch, I went to “VB 2008 Tips and Tricks”, an interesting session where I learned some things I’ll certainly use in my projects. After that I saw Dirk Primbs’ presentation about performance in WPF. That session was less good than his talk about creating a 3D game in 60 minutes at the Students to Business day, but I learned some things over there as well. After that, I joined Jeroen to an IT pro session about privacy by Kai Axford. It was a welcome break between all those developer sessions. The last session I saw on this first Techday was called “Windows 7 for developers”. It was a bit boring, but yeah, it was the last session of a long day and I already knew most of it because I’ve attended two sessions about Windows 7 at TechEd. Overall, another very interesting but exhausting day! Tomorrow I will probably only write a short update on the second day of the Techdays 2009. The Students to Business day yesterday was a great success. Over 800 students attended this day full of sessions at Metropolis Antwerp. 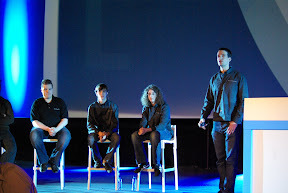 Apart from some technical problems, the entire day was well-organized and Microsoft managed to deliver good content. The keynote was all about Microsoft’s newest technologies, including WPF, Silverlight and Surface. The Surface demo, however, was a bit disappointing. They could have shown more of the power of this wonderful device, instead of just porting a WPF application and adding tag functionality to it. In the next session Kai Axford talked about how recruitment works at Microsoft. I heard some people saying he probably was exaggerating and I guess that’s kind of true. During the lunch break, students had the opportunity to meet the Business partners in the big hall downstairs. Over there they could inform about internships and vacancies at those companies. Of course, there was free lunch provided over there as well. After the lunch break, Katrien De Graeve did a session about WPF and Silverlight. I have only seen a part of that because I was working together with Jeroen and Kurt, the two other MSPs, on our session. The part I’ve seen of Katrien’s session was very good. Again: thumbs down for the technicians, we believed she was still trying to say something when they already started the music at the end of this session. Next, there was a panel discussion with some guys who have been working in IT for a while. The discussion was moderated by Caroline Phillips, the Academic Lead at Microsoft for Western Europe. This discussion was more like a long interview, Caroline asked good questions, but all six panel members more or less repeated what the previous one had said and then tried to add something. Needless to say that this was a bit boring. Conclusion: good concept, but it might need some tweaking. Then, it was our turn. This must have been one of the most exciting things I’ve ever done. Eight hundred students sitting in front of you, that’s a lot! I wasn’t that nervous and I think all went well, but I’m very eager to see the video of this session. It certainly was a great experience. Luckily, I wasn’t alone on stage. Jan Potemans, the mastermind of this event started our session by walking the audience trough some initiatives Microsoft has for students: DreamSpark, MSDNAA, … Then Jeroen Verhulst (MSP) talked about Student Partners, I talked about TechEd and Kurt (MSP) added something about our initiatives. Kenny Deriemaeker (second place ImagineCup 2008 Game Development) concluded our session with a brief overview of the ImagineCup. Last, but certainly not least, Dirk Primbs explained to the students how it’s possible to create a 3D game in one hour. We have only seen the last part of this presentation, because we were backstage after our talk, but I it was a great session as well as a nice ending to an exciting day. I have taken some pictures. Of course I don’t have any pictures of my own speech, but I’m sure that those will follow through other channels. The entire day was filmed and will be put online too. I'm a little late to announce this, but next week Microsoft organizes two events you should not miss! Both events take place at Metropolis Antwerp, Belgium.